when making the 14316kc cw and dsb transmitters one receiver was needed for monitoring the local signals. i have tried few projects with the direct conversion receivers. I had tried successfully the ring diode mixers but now a days dont have the ferrites. What a problem. due to this despite the caution of a good brewer (VU2ESE). I tried the ic based receiver.He suggested to use DC-40 receiver (ARRL origin) and re-produced world over. TA7358AP. a 9PIN sil package fm front end ic as used by py2ohh it worked but there was problem heavy am breakthroug could work as the local monitor but junked it. later on i found that py2ohh also used it as building block for his rigs IF stage. i should have taken the words of OM very seriously. This TA7358 will work within the superhet receiver as a second detector very fabulously. This ic also gives good performance as the mixers, frequency converters and A very very good DSB modulators. So, i love this ic but not worth for a dc receiver. So, back again looking for a good receiver to monitor all the signal from homebrew transmitters. LRR40 never worked. My main SAIT Marine is failing me on 40 meter in fact less than 10mhz it is becoming insensitive.a serious problem. I was upset. 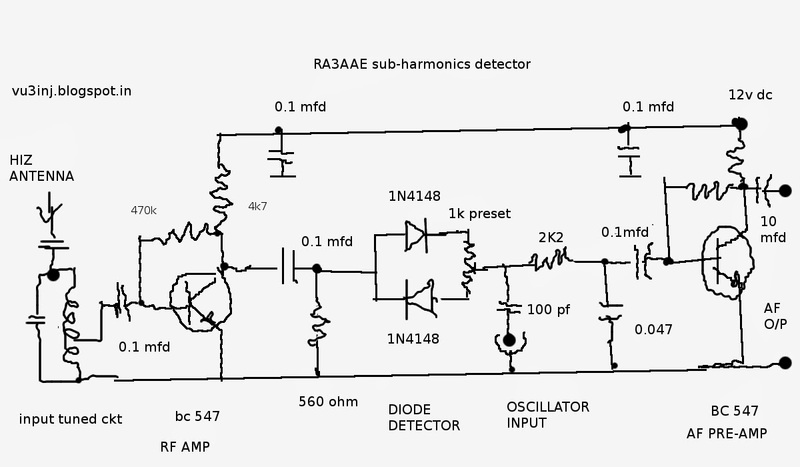 Then as a last try, there were two options 1.to work with the digital switches (4066) or 2. these un-conventional looking diode sub-harmonics detecktor. infact russian hams are very fond of this detectors. saw few ckts on net but finally decided to go with PA2OHH ( HE IS DIFFERENT FROM A BRAZINLIAN HAM-PY2OHH. PY2OHH has made the ararinha). 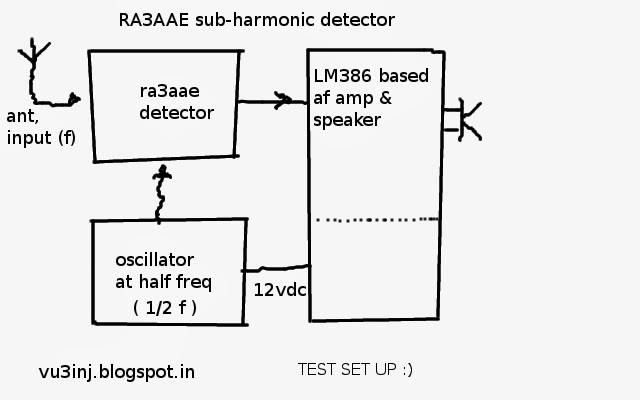 This european hams has done a good work on this sub-harmonics detector. he has extensively used it in his rigs. You would not beleive that, withing 10 minutes of the brewing it started working. I did not expected the performance to be so good. so i will stay with this detectors. beauty is that for 40 meter your oscillator needs to be on 80 meter. 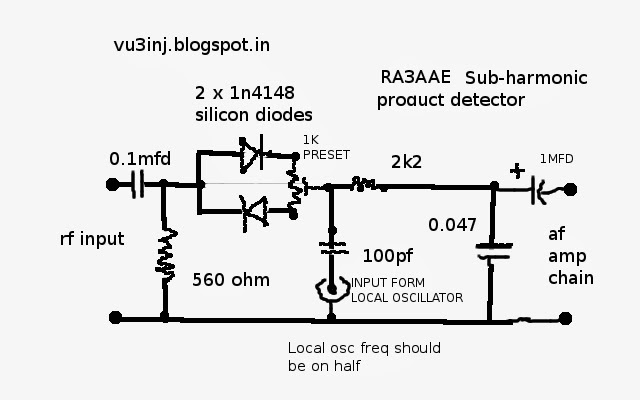 i can make the 80 meter oscillator using the ceramic resonators. it has half the signal frequency. so can be used as QSK signal monitor. will develope it further to a fullfledged receiver for 40 meter. For af amplifications a lm386 bases complete audio amp box was used. (see singal tracer post). a small 1 meter wire was used a s antenna. from left, wire-antenna,(tuned ckt is back of first board), ra3aae detector, oscillator. in the back-ground sketches of the the various ckt using this detektor. there was no guidelines. but, i understand that it is a balanced ckt so, measured the 1n4148 diodes forward resitance in the digital multimeter in 2k range. the two diodes which gave me the same reading were choosed.may be one or two ohm difference will work ! I am using this ckt. But would like to go for a commond base rf input amp and an common base AF AMP. the hiss of common emmiter in af amp stage is untolerable. My purpose of listening to the cw beacons is solved. so, its okey for me. will box it and if i make further refinements will inform. there need to taken care of the low impedance. p1 has to be low 220 ohm .... when i connected it with big antenna there was problem of complete am blanket so i have to redisign and make a good rf front end taking above issues. there are lots of the pair of xtals available ie. (24mhz-12mhz), (20mhz-10mhz,) (10mhz&5mhz), ( 8.866 mhz & 4.433 mhz) etc. so they can be used to test this detector and possibly use it in some-way or others. these detectors are better than other diode detectors in practical use. try it yourself ! This is one of my project which was realized within half hours including all the r&d. I am surprized why in VU, hams are not using this ckt ? i dont find any problem with it. I have taken the help of two sites. Second helpful reading is the http:// www.ke3ij.com / please aslo visit it. there is a beautiful explanations and his own experiments is shown. worth see his site. Good one. Nice research you are doing Indrajith.